It’s June, 1893, and in January the American Railway Association finally standardized timekeeping across all the railways. Why am I mentioning this? 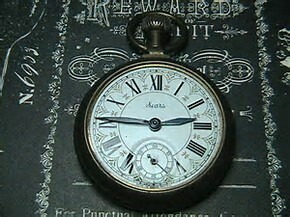 Because I am among the first watches made by the Ball Watch Co. given to a conductor on the Baltimore & Ohio Railroad. We’ve been keeping time of mostly coal runners over the past few months and it’s been thrilling. My conductor is a proud man of 20 years, who’s been conducting for three years now, and has a lovely wife. I watch from my position on his dresser as he makes sure his suit is trimmed and pressed, his tie straight, hair combed properly and shoes polished. He’s humming a happy ditty as he trims his mustache and combs it out for the last time. He then carefully picks me up and begins to polish me! Now I know it’s a special day. We won’t be timing a coal runner today, no sir. Today there will also be passengers, and I’m eager to see where we’re going. We get to the station, and he takes me out to check the time. I tick happily away with precision, the way I’m meant to. The train is waiting for us, and it’s a long one today. A few coal and freight cars; but we have several passenger, a dining car, and sleeping cars as well. This will be not be our usual short trip. My conductor begins to check over the train, making sure everything is ready and secure before passengers start coming aboard. As we’re doing the check I hear the announcement on the loudspeaker say, “All those going to Chicago now boarding.” My gears almost skip a beat! But I remember my composure. We were leaving out of New York, and I wondered why so many people wanted to go to Chicago in June. As the passengers board and tickets are punched I hear them talking about something called a World’s Fair. My conductor and I are not always riding the rails. In 1898 we spent some time in another place altogether. Aboard a ship with many others loading guns and firing on other ships flying Spanish flags. When he wasn’t doing that he was often taking me out and checking the time and clanging a bell to let others know all was well. When we returned to land it wasn’t long before we were off again, because in 1914 apparently the entire world had gone mad. We spent many a day, for four years, in pits called foxholes waiting for the right time to move, fire a gun, sleep, write a letter home, or just wait out the enemy. By the time the war was over, my conductor was an “old dog” with three sons and two daughters. One of his sons had decided to take up in his old trade of being a conductor, and my conductor decided it was time to pass me on to him in 1919. I was sad to see my old conductor go, but there was a smile on his face as his hands passed me to his son. So for him I happily ticked on to a new adventure. His son took me lovingly in calloused hands to a small home, and his cheery wife with a small son. He took out the cleaner and polish to clean out the rough spots, where the grit and grim of two wars had gotten in. It was nice to be bright and silver once more. After a rest my new conductor and I went to the job and I was in for a surprise. The trains have definitely changed since I first began timing them. They now had diesel engines, and ran faster than 50 miles per hour. Not only that, there were far more of them! Everywhere I looked on the tracks there were trains for every purpose, and they weren’t short ones either. Each consisted of several cars a piece. There were specific engines pulling cargo or passengers and each conductor worked a length of the train. We learned together as the new trains roamed the entire country. Switches were becoming electric, and controlled by engineers and others in faraway places. But our job was still important as timers because the engineers needed to know the time as we passed certain switches, or places. The excitement of the rails together was not to last forever though. Like my old conductor before, we experienced the world going mad once more in 1939. Again we spent many a time in foxholes or standing watch somewhere in the cold. Sometimes we were transported on ships to once again sleep in a ditch. Six long years we roamed the world, and I wondered if we’d ever get back home to the rails. In 1944 things changed. We were packed in with a bunch of other men on a PT boat on a cold, English June morning. My conductor continuously, nervously, pulled me out and put me back, making sure I was secure each time. Someone made a signal to our left, the gangplank was lowered and we piled out with the rest of the men. Running through water and then on sand, firing at and being fired upon. I was sure neither of us would make it past that dreadful day but somehow we did. Those which ran that terrible war sent us home afterwards. It was nice to see a home with my faithful conductor’s wife and their two sons. His eldest son had taken up the trade of being a conductor and as my conductor’s father did before him, my conductor decided to pass me on to his own son. I now knew it a loving family gesture, and happily ticked as his rough hands gave me to slightly softer ones in 1946. His son has the same loving hands, and they took me home to his wife and two daughters. He took out the cleaner, polish and once more the grit from sand and saltwater was taken from deep crevasses. I ticked a little louder out of sheer relief to be bright and shiny once more. I was eager to be on duty again, but it was nice to sit upon a dresser and rest for a bit. As morning dawned my new conductor took me in hand and set me properly in his pocket. He hummed a happy tune as we rode in a car to the rail yard, and I ticked merrily along with him. I found he was doing conducting on mainly passenger trains. It was pleasant to see him with a smile directing people along the aisle to seats, to sleeping bunks or the dining car. I was ever handy if someone asked for the time, or the engineer needed a time as well. It was after the birth of my conductor’s new son he grew concerned, for it was 1952 and apparently our country was concerned with political matters in Korea. With a great amount of luck his country did not call, and our service to the rails continued uninterrupted. We enjoyed this luck for a good 17 years, and watched as his daughters grew, were married, his son took a job with a computer firm, and two new sons were born. Somehow, I knew this bliss could not remain. My inner cogs clicked with dread when in 1969 a yellow letter came, and my conductor and I were off to war again. His country sent us to someplace called Vietnam where jungles were the norm. We often had to duck and cover from something planes sprayed he called agent orange. For six long years we slugged through marshes, valleys and more jungles than eyes should see. We watched as friend, comrade and foe alike fell before many an onslaught. I had thought the last war was dreadful, but this one has put all the others to shame, causing me to wonder who was to blame. My valiant conductor fought bravely with me forever at his side. In 1973, when the night was coldest, death came quickly to his side. I came back, with my brave conductor, in a metal box. I’d never before experienced such loss. My cogs were soggy, my gears a bit rusty and my silver coat covered in mud. Somewhere within me, I think, a bit of me died. As my conductor’s box set down, a hand reached in and picked me up. They set me carefully upon a field of stars. I was then carefully transported, while bugles played and gunshots rang, to the soft, loving hands of my conductor’s wife. I do not know the significance of the ceremony which transported me into those loving hands. But she took me to someone who took me apart, cleaned every nook and cranny, cog and gear. Polished my silver cover bright, and put everything back together. I was honestly surprised when I started ticking once more. I thought I would then be taken back to my conductor’s wife, and perhaps given to one of her son’s as once I had been before. Instead, when I came back, she carefully placed me upon that field of stars, placed me in a box, with those stars, and now I sit forever on the mantle and watch their family grow.